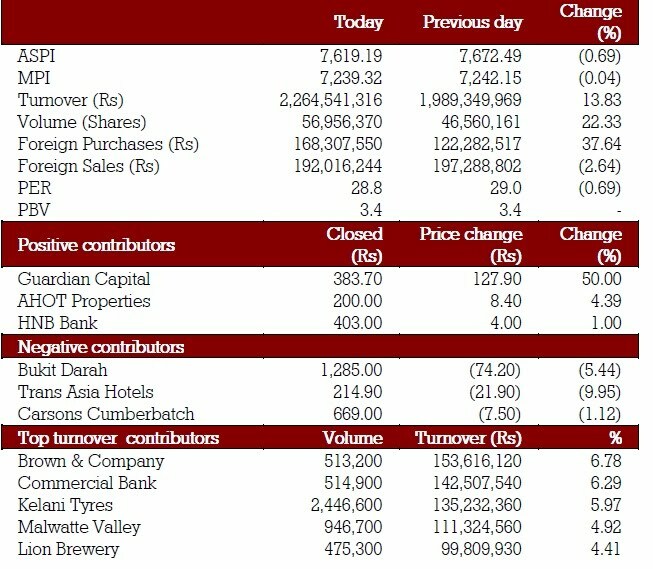 Indices dropped in the absence of aggressive investor participation on Monday the 21 February 2011. Mixed reactions to the positive interim results were witnessed. Profit taking weighed on indices eventually despite the accumulation witnessed on certain stocks. The All Share Price Index (ASPI) closed at 7,617.19 points dipped 0.72% by 55.30 points and the Milanka Price Index (MPI) closed at 7,239.32 points, dropped 0.04% by 2.83 points during the day. Total turnover was at Rs. 2.6 billion topped 13.83% with a total volume of 55.95 million shares changing hands (up 22.33%). Foreign purchases rose 37.64% to Rs.168.3 million and foreign sales fell 2.64% to Rs.192 million. Meantime the Price to forward Earnings Ratio (PER) depreciated 0.69% to 28.8 times. Bank, Finance & Insurance and Manufacturing sectors were the highest contributors to the market turnover. Bank, Finance & Insurance sector index decreased by 0.24% while Manufacturing sector index increased by 0.21%. 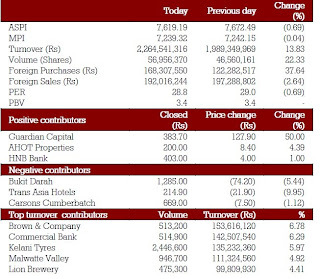 Brown & Company (BRWN) made the highest contribution to the market turnover while the share price decreased by Rs 4.80 (1.63%) and closed at Rs.290. Two crossings were recorded for 185,000 shares of Commercial Bank (COMB) at Rs.154 and 950,000 shares of Kelani Tyres (TYRE) at Rs.55. Amaya Leisure (CONN) announced a first interim dividend of Rs.6.00 per share last Friday. HNB Bank (HNB) announced a final dividend of Rs.5.50 per share last Friday. Middle East continued to rattle sentiment. FTSE 100 index opened 0.2% lower. Asian share markets were mostly lower amid escalating unrest in the Middle East and an early surge in crude-oil prices. Nikkei was down 0.8%. Sri Lankan Secondary Debt Market Treasury bond yields were up, while the market activity was relatively high. Sri Lankan Rupee appreciated slightly as the exchange rate was recorded at Rs.110.85 to Rs.110.87 per US Dollar.